Why use Online Customer Feedback? Think about it. Carrying out an A/B test on your website or mobile app (without prior insights gained from customer feedback) is actually just you testing your own assumptions. And the odds are you are using a hypothesis that is probably based on what you think will solve your customers’ problems. While this method may work for some businesses, it isn’t exactly efficient and can really limit your optimisation efforts. If you throw customer feedback into the equation, however, you will be in a much better position to make an informed decision about what your hypothesis should be. This is because you are combining qualitative data with quantitative data. It will help you identify areas of struggle that you haven’t previously recognised with your web analytics tool. Picture this. Let’s say that based on feedback you’ve collected from your customers you learn that on one of your product pages many customers are saying that the “I don’t know how to place an order”. With this information you can build a hypothesis that will effectively test the feedback. For example – “Increasing the size of the Buy Now button will make it more prominent and thus increase conversions”. Voila! You have a useful hypothesis to use in your A/B test. When we think of A/B testing, we often think of page design, e.g. comparing two different coloured CTA buttons, various images. But did you know customer feedback can help you in this type of testing as well? Some feedback tools offer visual feedback options within their software. 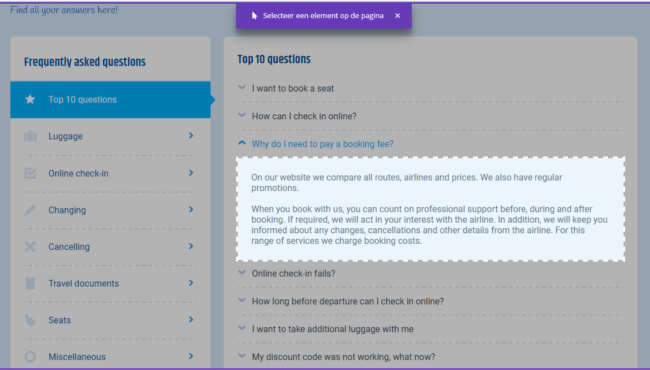 Visual feedback enables website visitors to pinpoint specific page elements (including forms, images, buttons or paragraphs) and provide feedback on those page elements (using screenshots rendered by the software). Identifying these issues allows you to make instant improvements to the user experience and usability of their website and thus increase online conversions among customers. These insights can also be used to create more narrowed down hypotheses which can then be tested in a split test or A/B test. Using exit feedback forms, businesses can learn a lot about the intentions of their visitors as well as the problems their experiencing. 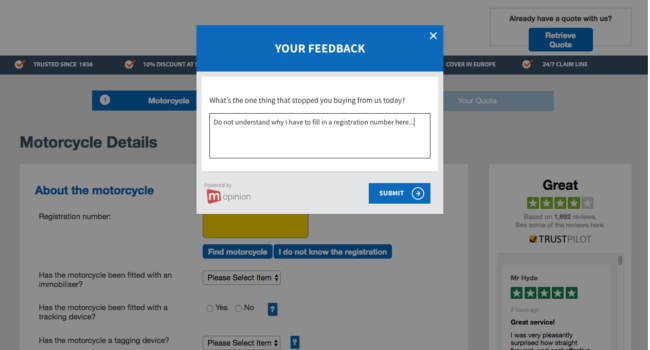 These types of feedback forms appear when visitors are, for example, trying to leave the website or click away from the shopping cart without converting. 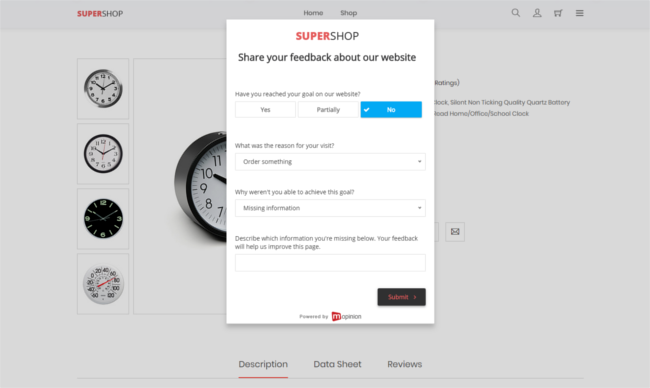 Applying exit feedback forms in locations such as ordering funnels or your shopping cart (for ecommerce businesses) can help visitors reach their online goals (e.g. ordering products or getting online support) but it can also help you quickly identify problem areas on your website. With insights on what is impacting visitor behaviour, you can start running A/B tests to confirm your hypotheses. For example, perhaps you have a high bounce rate on the checkout page (e.g. customers leave their shopping cart without purchasing). This is a great place to collect exit feedback. Then based on the responses you receive from visitors in the exit feedback forms, you can start carrying out relevant tests on the page. Note: As you can see in the feedback form above, there is an open comment field. What’s great about these fields is that the feedback submitted here can later analysed using text analytics and sentiment analysis to give you better insight into emerging trends (e.g. based on word frequency or word pairing). Another type of feedback that is beneficial in terms of optimising A/B Testing is website content feedback. This can be collected using an embedded feedback form on a page that includes a lot of text, e.g. FAQ, instructions, or e-manuals. Alternatively you can enable a proactive trigger when the visitor has scrolled to the bottom of the page. Understanding how this content is received by your visitors is crucial in that poor content can make or break sales or put off a visitor to your brand. Let’s look at product information. This type of content often includes product descriptions, videos, and images. So let me ask you this. How many times have you or someone you know been on a website researching a product and after looking through the specifications, you still couldn’t find what you were looking for? This is common among many websites that do not use customer feedback, simply because they do not know that they are lacking important content. And what happens is your visitors cannot find the answers to what they’re looking for so they’re forced to search elsewhere. With online content there multiple options for testing. You can experiment with post length, images, the overall layout, headlines on the page, and of course, text blocks. So how do you use this feedback in your A/B testing? Say you receive feedback from a customer: ”I cannot find any information in your FAQ section about returning a product”. This could be a result of one of two things. Either the information simply does not exist in your FAQ section – in which case you are now aware and can add some information if necessary – or the information is available but your visitor is having a hard time finding it due to the layout of your FAQ page. If it is the latter, you can form a hypothesis using the feedback you received and test the following, “Making clearer headlines for the FAQ sections will make information easier to find”. This is a very easy solution for understanding where you’re going wrong (or right!) with your website content. 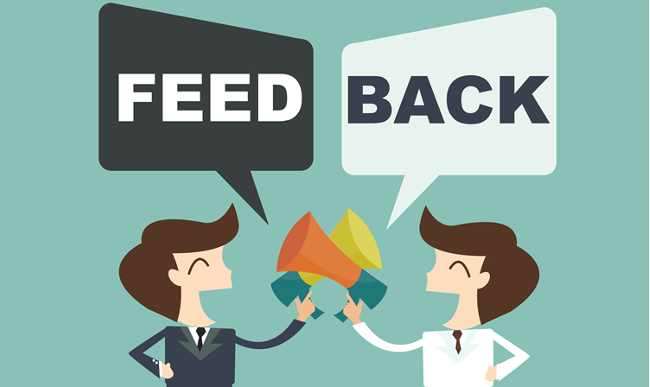 Online feedback can further assist in the optimisation of your website if it is combined with the data collected from various personas/customer profiles on your website. Why? It enables you to understand how a particular customer profile experiences the online journey. More specifically it helps you pinpoint the user experience of each individual persona and how they compare with other personas. Coupling these personas with your feedback is very simple. Many online feedback tools, such as Mopinion make it possible for you to collect website data together with feedback. This data can include demographics, interests, location and more. For example, you can combine a cookie ID or data stored in the Google Data Layer (e.g. client or segmentation data, product information, etc.) with feedback and gain a lot of insight into how a particular persona or customer segment experiences your website or the online journey. In A/B testing, this is very useful as you can target certain tests towards certain personas based on the feedback you received from those personas. This will give you great insights into how these different segments of visitors experience any given page. With this information, you’ll be sure to offer the most powerful CTA or content for each persona. Do you now see how powerful these two are if they are used together? By collecting feedback from your customers you are guaranteed to have a much better (and deeper) understanding of what should take priority in your A/B testing. Not to mention the continuous optimisation of your website or mobile app can save you a lot of time and money as well as build up loyalty with your customers. It’s a win-win! Want to get started collecting online customer feedback?